President Obama has said a nuclear deal with Tehran may not be reached by a November 24 deadline, as crucial nuclear talks between Iran, the US and European Union enter a second day in Oman. 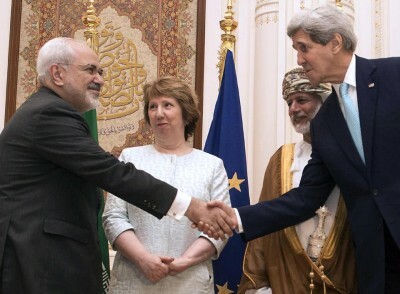 US Secretary of State John Kerry, Iranian Foreign Minister Mohammad Javad Zarif, and the European Union’s foreign policy chief Catherine Ashton are seeking to close gaps on key issues, in pursuit of a comprehensive agreement before interim arrangements expire. There are conflicting statements from Iranian officials that the Supreme Leader’s top aide, Ali Akbar Velayati, may join the discussions. The tripartite talks, scheduled to end on Monday, will be followed by negotiations between the political directors of Iran and the 5+1 Powers (US, Britain, France, Germany, China, and Russia). Are we going to be able to close this final gap so that [Iran] can re-enter the international community, sanctions can be slowly reduced and we have verifiable, lock-tight assurances that they can’t develop a nuclear weapon? There’s still a big gap. We may not be able to get there. No details of Sunday’s talks were released. Iran and the 5+1 Powers are still debating key issues such as the level and number of Tehran’s centrifuges for uranium enrichment, the lifting of US-led sanctions, and the duration of an agreement. We did not want to submit to the enemy. They insisted on suspending Iran’s enrichment program but we did not consent to it. The Security Council issued six resolutions that all called for the immediate suspension of all enrichment activities in Iran, but we resisted. After ten years of resisting, and only after the West consented to Iran’s enrichment program did we decide to negotiate with them, and in this battle of wills, the will of the Islamic Republic came out victorious. Citing unnamed Iranian Government officials, The Times of London claims that Iran and the US are discussing the possibility of opening an American trade office in Tehran if nuclear talks reach a comprehensive agreement. The office would be the first American official presence in the Islamic Republic since the US Embassy in Tehran was overrun in 1979. The officials reported said that the talks will continue this week in Baku, Azerbaijan. The Iranian delegation is led by Mohammad Reza Sabzalipour, head of Iran’s global trade bureau. The US State Department denied the report. The Revolutionary Guards announced on Monday that they have flown a version of the US RQ-170 drone that they captured in December 2011. The commander of the Guards’ Aerospace Force, General Amir Ali Hajizadeh, said that footage of the flight will be released soon. The drone was unveiled in May in a ceremony attended by the Supreme Leader. The American RQ-170 was seized in northeastern Iran. The Iranians claimed they had downed it with electronic warfare. Tehran’s subsequently said that they had reverse-engineered the RQ-170 to build its version.